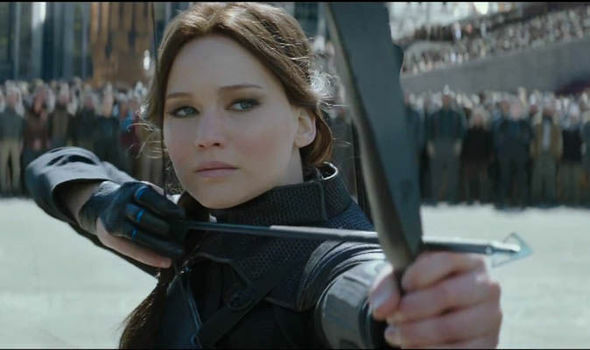 In the Hunger Games movies, Katniss uses a bow as her primary weapon. 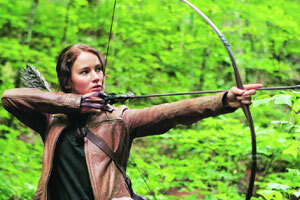 Not considering her actual shots (hitting her targets), does Katniss show how to properly use, hold, and handle a bow? Did Jennifer Lawrence have to learn how to handle a bow for this part, or did they simply just say, "Here, hold this fancy bow and pretend to use it"? Jennifer Lawrence was trained by Olympic archer Khatuna Lorig. To prepare for her role as "Hunger Games" heroine Katniss Everdeen, Lawrence trained with professional archer and Olympian Khatuna Lorig to learn how to properly shoot with a bow and arrow. "She was lovely," Lorig told the Associated Press. "We had a great time coaching and working together." Given her connection to the film, Lorig was one of six Olympians featured in a recent Glamour spread. The Olympic archer, together with a few of her fellow female archers, will also grace the cover of an upcoming special-edition "Hunger Games" DVD. Katniss's archery performance is mostly genuine, but she should hold her bow differently and she might be unrealistically fast. Yes, Jennifer Lawrence was apparently trained by Olympic level archers. So I'm sure she had very good technique, based on actual archers. However - all of her training was precisely Olympic-style archery, aka target archery. Katniss would not be shooting at a stationary target, nor would she be standing very still for very long (I admit I am guessing, as I have not seen much of the movies). As Lars Anderson points out in this fascinating video, so-called "War archery" is quite a bit different - and looks mostly different from what Katniss - and most other Hollywood archer characters - tend to do. (See also some verification of his claims here). Perhaps the only thing she got genuinely correct was keeping both eyes wide open, instead of squinting with one eye, as is often done in target archery. Jennifer Lawrence was trained by an Olympic athlete. Khatuna Lorig has a cornucopia of accomplishments to be proud of: she’s mastered the sport of archery, competed in five Olympic Games, and won a silver and a bronze medal. But despite all of this, the achievement most likely to garner squeals of delight from strangers is the fact that she is responsible for teaching Jennifer Lawrence how to shoot a bow and arrow in The Hunger Games. Lorig, an archer from Georgia (the country) who competed for three different countries at four different Olympic Games, was making the transition from medal winner to archery coach when she was asked to teach the then-21-year-old rising starlet the sport she’s spent her whole life perfecting. Lars Anderson is an amazing archer, but the idea that archers ever had wildwest style close rage rapid fire shootouts is nonsense. Mongol and Turkish archers all carried swords and other weapons for close combat. Also, their bows were of military draw weight, from 70 to 110lbs, so until Lars can replicate his feats with bows this powerful he's just an amazing stunt archer. Another misconception about military archery is that aim was particularly significant. The idea of military archery was to lay a continuous barrage of arrows into a body of men; aim was confined to distance and general direction. By the time aiming range was reached a wise archer would have picked up his sword, ax or club. In a military scenario the ability to pull a strong bow quickly was much more important than hitting bullseyes. Katniss's style should have been based on Howard Hill's or modern primitive (I know) archer, Ryan Gill's. In Avengers, how plausible is Hawkeye's archery proficiency? What are the special properties of Katniss' bow?